The kitchen is the place where I manage to best put my imagination into practice. I could stay there for hours as every moment is an opportunity to experience a new combination! 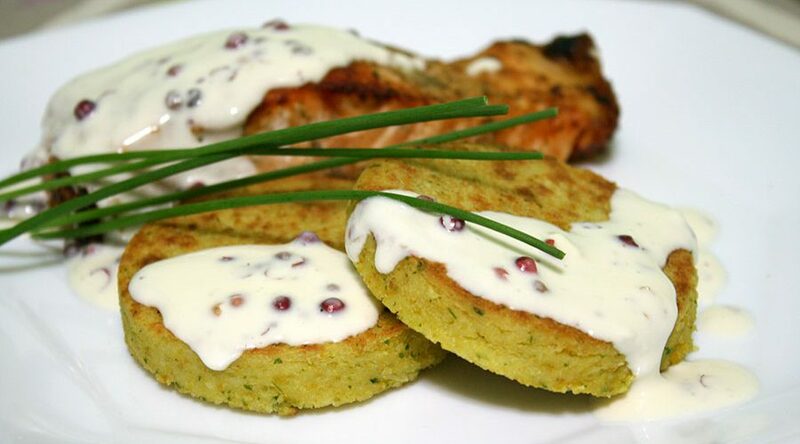 I enjoy couscous in any form and this time I combined it with chickpeas to get some flat savory cakes to accompany a piece of salmon, all covered with red pepper cream sauce. First of all, put the 2 tablespoons of red pepper in some cold water to hydrate! Cover the salmon with lemon juice, chopped garlic and ground spices and let it cool for 30 minutes. For a better absorption of all the flavors, you can marinate the salmon in one of our vacuum containers. Keep in mind that it is not recommended to vacuum garlic, so just add it right before you put the salmon in the oven. Read our BLOG for more details on the benefits of marinating under vacuum. Preheat the oven at 175 degrees Celsius. Place the salmon in a bowl, cover it with aluminum foil and put it in the oven for 25 minutes. When the time has passed, remove the foil and spray the fish with olive oil to get a shiny appearance. Place it back in the oven for a further 5 minutes. When the salmon is ready, it is time to do the cakes. Put the couscous in boiling water and leave for 5 minutes. Once complete, whisk the couscous with a fork. Finely chop parsley and garlic and place it in a bowl alongside chickpeas (be sure to remove the husks), and grind until a paste is obtained. Add the eggs, lemon, cold couscous, salt and pepper. Place in the fridge for 30 minutes to bind the ingredients! Form flattened cakes, about 2cm thick and fry them in 2 tablespoons of olive oil until a golden color. Red pepper cream sauce is quick to cook and I advise you to prepare it last. Add the hydrated red pepper in 200 ml cream and stir gently for 2-3 minutes over medium heat to prevent sticking. Garnish your plate with a few strands of chives.